Why is a consultation with a CAPS specialist so important? That’s a great question and many people ask that. Simply stated, Tim St. Hilaire, Certified Aging-in-Place Specialist, understands the technology, tools and resources that are available to Seniors. Our needs change as we grow older. What worked for us when we were young and had kids in the house may not work any more. Maybe your balance isn't quite as good as it used to be or you can't climb the stairs easily or your eyesight isn't quite as good and there are lighting issues. That doesn't mean you have to leave your home! As a child visiting our aging parents, are you seeing them have more difficulty getting around and are you concerned about their safety and well-being? Tim has been trained to assess the environment you or your parents are living in. From how easy is it to get to the mailbox, to making it safer in the bathroom. He will come on site to your home anywhere along the coast from Brunswick to York Maine (or elsewhere in Maine if needs be) and assess the situation. He will want to get to know your daily routine and thoroughly review your home and its surroundings. He will devise a plan with recommendations for making your life easier and safer. Call 207.632.5228 or email Tim today to set up an appointment. An assessment will result in a plan for Better Living in your home and give you peace of mind as you age-in-place. 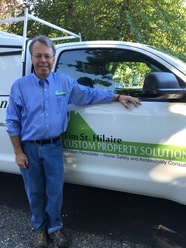 Tim will cover over 35 points in your home that prepares your home to be “age friendly”. This report will incorporate universal design principles that will make your home safer and more comfortable for you and your visitors. He will take pictures to help illustrate the revisions he recommends. Enjoy your independence as Tim creates that barrier-free living environment that you deserve to have - in your own home! ​As a certified CAPS graduate, Tim pledges to uphold a code of ethics and maintains his designation by attending continuing education programs. His knowledge and experience in home remodeling serve him well as he helps you live more safely in your own home.